What America needs most is a wingnut third-party candidate. The two most salient facts about Mitt Romney’s presidential candidacy as the January primaries approach are that he is always first or second in the polls and that his support is stuck at about 25 percent. It’s premature to call Romney the presumptive nominee before any votes are cast, but this year’s Republican field is so weak that alternative outcomes are pretty hard to imagine. Yet the GOP base remains wary of Romney because of his moderate record in Massachusetts and the extreme pliability of his political views. Republicans will probably nominate Romney, but it’s doubtful they’ll enjoy doing so. All of which leads to one inescapable conclusion: It’s time to audition a right-wing, third-party candidate. Most recent talk about a possible third-party presidential run has focused on the centrist, nonpartisan group Americans Elect. Bankrolled by a former leveraged buyout tycoon named Peter Ackerman, Americans Elect is inviting voters to draft a candidate via the Internet. The effort has won praise from Matt Miller of The Washington Post, Thomas Friedman of The New York Times, and Doyle McManus of the Los Angeles Times. “[I]t just might reduce the polarization that has infected the two major traditional parties,” McManus wrote on November 20. But polarization hasn’t infected the two major parties. One major party has been hijacked by its extreme wing while the other has struggled, unsuccessfully, to coax it back toward the center. During the super committee negotiations over the deficit, Democrats proposed a roughly even split between budget cuts and tax increases. Republicans initially refused to consider tax increases at all, then “compromised” by proposing $300 billion in tax increases combined with $2 to $3 trillion in tax cuts. GOP candidates routinely sign a pledge never, ever to raise taxes. Democratic candidates aren’t even asked to sign a parallel pledge never, ever to cut entitlements. A May report by the Pew Research Center for the People and the Press sketched out these mythical twin poles. On one side, you have “staunch conservatives” who “take extremely conservative positions on nearly all issues.” On the other, you have “solid liberals” who “express diametrically opposing views ... on virtually every issue.” But their disagreement is less striking than what Pew calls their “intensity gap.” Eighty-four percent of staunch conservatives say they “strongly disapprove” of President Obama’s performance, as against 64 percent of solid liberals who “strongly approve.” Seventy-three percent of staunch conservatives say Republican leaders have the better approach to the deficit, as against 58 percent of solid liberals saying Obama does. On health care reform, 80 percent of staunch conservatives say it is mostly “bad for the country,” as against 43 percent of solid liberals saying it is mostly “good for the country.” A party that can’t get a majority of its most extreme partisans to support its greatest domestic-policy victory can be called many things, but “polarizing” is not one of them. In sum, we don’t need a moderate, centrist third party. We need an extremist conservative third party to accommodate the wingnuts who can’t abide their likeliest nominee. My motive for saying so is of course impure. With unemployment at 9 percent and an approval rating at about 44 percent, Obama could use all the help he can get. But, if a spoiler candidate emerges—and I think one probably will—it won’t be to accommodate liberals like me. It will be to accommodate conservatives who wonder why their party wants to give ObamaCare’s architect the keys to the White House. A stickler will tell you that only once in the last century did a third-party presidential candidate win enough votes to alter the outcome in a two-party race. The spoiler was former president Teddy Roosevelt, who, as the Progressive Party’s candidate in 1912, outpolled his White House successor, William Howard Taft, in both the popular vote and the electoral college, thereby ushering Woodrow Wilson into the Oval Office. Many would argue that Ralph Nader’s 97,488 Florida votes put George W. Bush in the White House, but the official Florida count had Bush beating Al Gore by fewer than 600 votes. With a margin that microscopic, the number of plausible determinants approaches infinity. No subsequent third-party candidate ever matched Roosevelt’s 27 percent of the popular vote. Ross Perot came closest in 1992, with a whisker under 19 percent, but he didn’t win any electoral votes. Strictly by the numbers, then, modern third-party candidacies don’t swing presidential elections. But luring votes away from a major-party candidate is only one way a third-party candidate can affect the outcome. He can divert organizing talent and, to some extent, the flow of campaign contributions. He can force a major candidate to devote scarce resources to shore up support in a particular state or region. And he can sow dissatisfaction. George Wallace didn’t cost Hubert Humphrey the presidency in 1968 in any direct way. Nor did votes cast for Perot cost George H.W. Bush reelection in 1992. (Perot drew votes equally from Democrats and Republicans, but the flavor of his campaign rallies was very GOP.) Nonetheless, Humphrey and Bush both lost. Harry Truman won reelection in 1948 despite third- and fourth-party challenges from Henry Wallace on the left and Strom Thurmond on the right. But Truman won by such a narrow margin that the Chicago Tribune famously reported (initially) that he lost. Are spoiler candidacies a cause or a symptom of voter dissatisfaction? Probably both. The likeliest third-party candidate within the current Republican field is Ron Paul. He’s done it before (on the Libertarian ticket), and, though he says he doesn’t want to, he also says he probably won’t support another GOP candidate. Paul is a sort of godfather to the Tea Party movement, and getting Tea Partiers stirred up about Romney’s perfidious support for the health care mandate (albeit only at the state level) would certainly be worthwhile. But Paul wouldn’t likely attack Romney on social issues. 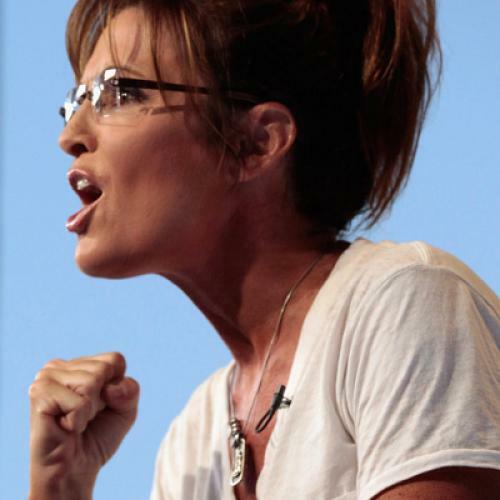 That’s why I nominate Sarah Palin to run as a political independent. She’d probably see the certainty of failure as a plus, given her demonstrated scant interest in office-holding (as opposed to campaigning). It would be good to see her burn bridges with Republican establishment figures like Fred Malek and William Kristol. And she could give those staunch conservatives a place to call home. Everybody wins. Except Romney, that is. But, then, that’s the point. Timothy Noah is a senior editor at The New Republic. This article appeared in the December 15, 2011, issue of the magazine.